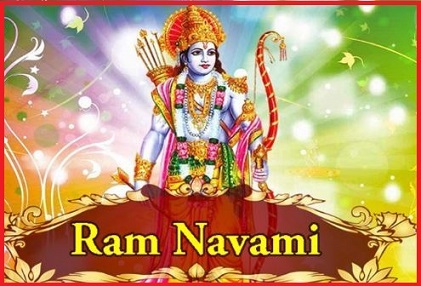 Ram Navami is a Hindu festival, which celebrates the birth of Lord Rama to King Dasharatha of Ayodhya. Lord Rama is regarded as the 7th avatar of Vishnu. Ram Navami festival is celebrated on the 9th day of Chaitra Navratri month (the first month in the Hindu lunar calendar). The day marks the culmination of the spring festival of Vasanta Navratri (Chaitra Navratri) which begins on Ugadi. On Ram Navami festival many celebrations are organized at Ayodhya in Uttar Pradesh and Ramesvaram in Tamil Nadu which attracts thousands of devotees. Ram Navami is a public holiday in India and its date may vary. This year in 2019 the festival occurred on 14th April 2019 (Sunday). Lord Rama was the hero of the Ramayana, the ancient Sanskrit epic.